Carbon monoxide is a colorless, odorless gas. Unfortunately, it can also be very deadly. The best home security system is one that will detect this gas quickly and efficiently, in order to reduce the chances that it can harm anyone. With that in mind, though, sometimes carbon monoxide detectors malfunction. When they do, fixing them fast is a good idea. That way they work again, and provide the homeowner with safety, security, and peace of mind. Homeowners should periodically check and test their carbon monoxide detectors to make sure they’re working the right way. That adds to the level of security the homeowner has, and also helps a homeowner learn about the systems they have in their home. When they know more about the system, they can focus on any issues they find and how best to correct them. That gives them insight, and keeps the system working the right way, as well. Depending on the make and model of detector, a flashing red light can be a good thing or a bad thing. While that’s a bit counter-intuitive, it’s the way these systems work. Every make has the opportunity to do something different if they want to, and some companies adjust what they offer in order to stand out or to make sure they give homeowners an easy way to tell if there’s a problem or not. Some companies have flashing green lights to show that the detector is working — other companies have flashing red lights to show that the detector is functional. For the companies that have flashing red lights as the standard option, there’s no action needed. For detectors that normally have flashing green lights, a flashing red light can mean that the batteries need to be replaced or there’s another type of malfunction that needs to be addressed. 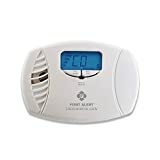 A homeowner should take a careful look at the carbon monoxide detector when they get it, so they know what it typically flashes — green or red. Then they can see whether there’s a problem with the detector or whether the red light is what it typically flashes in order to show it’s working the right way. 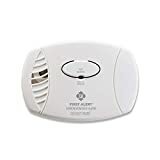 That way they’ll know quickly if there’s a problem, or if they need to make adjustments to the carbon monoxide detectors they have in their home. With the right security system, there should be notifications when things malfunction. But if the carbon monoxide detector isn’t tied into the system it may not let the homeowner know there’s an issue. 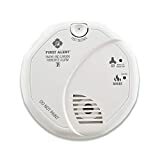 Checking the detectors in the same way a homeowner would check their smoke alarms, for example, is a great way to ensure that the problem is fixed rapidly. That will restore peace of mind and security for any homeowner. Overall, the best security system is the one that works for the homeowner, and that includes the value of carbon monoxide detectors and other important devices. When there’s a red light on the detector, it’s vital to know if that’s normal for that brand or if it’s a warning that something isn’t quite right.